Isa an ti y’ tiike ekk’undumu a peedo t’ize k’aadumu mesuwe. (Jesus they nailed him on cross at hour for eating rope). Here the NIV is a literal translation of the Greek, indicating that Jesus was crucified at the third hour after sunrise, or about 9 am. Many English translations make the time clearer for the reader by using ‘nine o’clock in the morning’ rather than ‘the third hour’. In the Gergiko language of Chad it was decided to do the same thing by using the local expression for that time of day rather than ‘the third hour’. Traditionally Gergiko speakers don’t use numbers for indicating time, but rather expressions indicating the position of the sun. The expression used here is ‘peedo t’ize k’aadumu mesuwe’ – literally ‘sun she makes for eating rope’. Here ‘peedo’ = ‘sun’ is equivalent to hour/time. As for ‘eating the rope’, in the village people tie up livestock with a length of rope woven from palm leaves. If the animal has not been fed first thing in the morning, it will take responsibility for the situation itself, by eating through the rope, and going to look for its own breakfast! PRAY: It is the home stretch for the Gergiko translation! 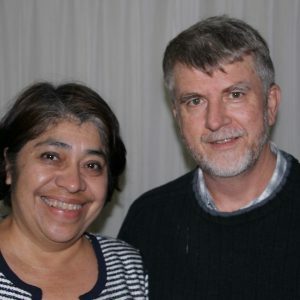 Please pray for the translation team and their families and for Dave and Elly Sharp as they work towards completing the New Testament by early 2019. Explore! Find out if translation and language-related work is a potential path for you at a Wycliffe event.